It’s hiding in your gut right now. Quietly wearing down your blood vessels. Silently stiffening your arteries. And ultimately, harming your heart. When your gut bugs metabolize certain plant and animal foods TMA (trimethylamine) is produced. The TMA hitches a ride through your bloodstream to your liver. And once there, it becomes oxidized creating heart-damaging TMAO (trimethylamine N-oxide). Research has already linked TMAO to an increased risk of hardening of the arteries, heart attack, and stroke. And now a new study has confirmed it. Soaring TMAO levels, as we age, are likely why around 70 percent of Americans 60 or older develop heart disease. In fact, in the recent study researchers found that older mice had THREE TIMES as much TMAO as the younger ones. University of Colorado scientists started a mixed group of young and old mice on a broad-spectrum antibiotic. The goal was to kill off the majority of their gut bugs, or microbiome. Then they ran some tests on the critters. They looked at the lining of their blood vessels. They measured the stiffness of their arteries. And they took measurements of inflammatory compounds, free radicals, antioxidants, and nitric oxide levels. At around four weeks something REMARKABLE had happened. The young mice didn’t have any changes in their vascular health. But the SENIORS sure did. There were VAST improvements in everything they measured. 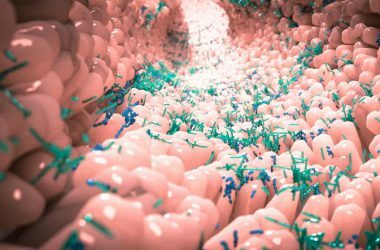 Killing off the gut bacteria had begun to reverse the vascular damage that was seen in the older mice before treatment. In fact, their vascular health had been restored to the levels of the younger mice. They had essentially aged backward. We’re learning more about your microbiome every day, and there’s still a LOT to learn. But one thing we already know is that when it comes to gut flora, it’s all about balance. If your “bad” or damaging bugs outweigh your “good” bugs, it can harm your health. And that balance tends to slip more and more as we age. Which is why the guts of the older mice hosted significantly more illness-linked bugs such as Proteobacteria and inflammation-promoting bugs such as Desulfovibrio. And now the new research shows that with age our gut bugs appear to also begin to produce more toxic molecules, including that TMAO I told you about earlier. When the TMAO molecules get into your bloodstream, they cause inflammation, oxidative stress, and tissue damage. But if you’re considering wiping out your OWN microbiome to help protect your heart don’t. That would be a health DISASTER in the long term. Your belly bacteria help keep you healthy. A well-balanced microbiome can help with everything from managing your weight to your mental health. And imbalances are linked to a higher risk for all kinds of troubling issues ranging from cancer to obesity. Instead, focus on lowering your TMAO levels. You can start by eating more probiotic-rich foods such a yogurt, kefir, and kimchi. Consider taking a probiotic supplement. And be sure to feed your good bugs with plenty of prebiotic fiber found in legumes, apples, steel cut oats, and green bananas. But don’t stop there. Researchers say dimethyl butanol, a compound found in olive oil, vinegar, and red wine could help block the production of TMAO. In a study, pistachios significantly decreased TMAO. And vitamins B and D, as well as resveratrol, could all help to reduce your levels too. They say age is just a number. Let’s prove them RIGHT by refusing to let this hidden gut toxin harm your heart and your health.